68 Marlborough is located on the south side of Marlborough, between Berkeley and Clarendon, with 66 Marlborough to the east and 70 Marlborough to the west. 68 Marlborough was designed and built ca. 1870 by architect and builder Charles K. Kirby, one of eight contiguous houses (66-68-70-72-74-76-78-80 Marlborough) he built between 1866 and 1870 for speculative sale. On October 20, 1870, the new house at 68 Marlborough was purchased from Charles Kirby by Harvey D. Parker, the founder and owner of the Parker House hotel. He and his wife, Julia A. (Brown) Parker, lived at 141 Boylston. Charles Kirby also assigned to him his right to purchase the land at 68 Marlborough from the City of Boston, and Harvey Parker purchased the land directly from the City. Click here for an index to the deeds for 68 Marlborough. On February 15, 1884, M. Louise Putnam acquired 68 Marlborough from Harvey Parker. He died three months later, in May of 1884. M. Louise Putnam continued to live (and operate the school) at 68 Marlborough during the 1885-1886 winter season, but moved thereafter to 36 Commonwealth. On February 23, 1886, 68 Marlborough was acquired from M. Louise Putnam by Dr. Grace Wolcott. She and Dr. Lena A. Ingraham made it their home. They previously had lived at the Hotel Cluny at 543 (233) Boylston. Both physicians, Dr. Wolcott and Dr. Ingraham were associated with the Trinity Dispensary. They became the first medical staff members of Vincent Memorial Hospital when it was formed in 1891 to provide medical services to wage-earning women. By the 1887-1888 season, they had been joined at 68 Marlborough by Dr. Ella L. Dexter, a physician and ophthalmologist. Lena Ingraham and Ella Dexter continued to live at 68 Marlborough during the 1894-1895 winter season, after which they moved to 7 Gloucester. By the 1886-1897 winter season, Dr. Wolcott had been joined at 68 Marlborough by Miss Bertha von Seckendorff, a teacher. 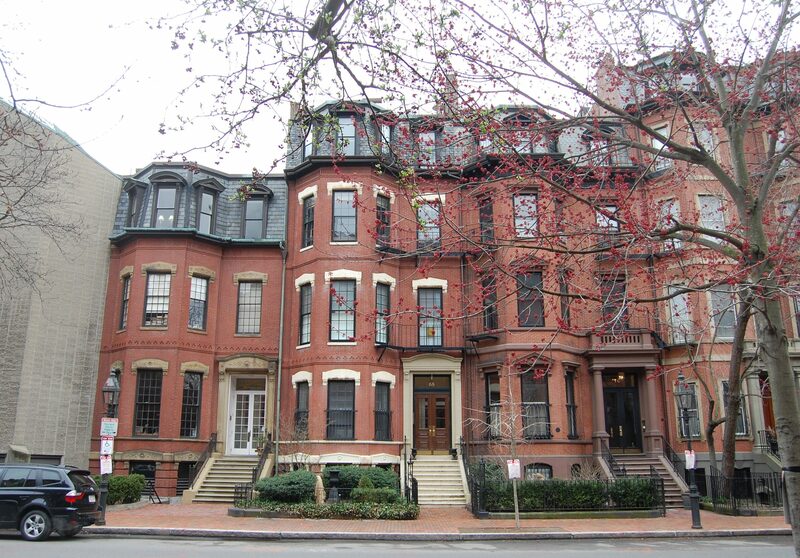 She continued to live there until about 1899, but had moved to 7 Newbury by 1900. From about 1899. Miss Laura Fisher lived with Dr. Wolcott. She was a teacher and the first director of Boston’s kindergartens. Dr. Wolcott and Miss Fisher continued to live at 68 Marlborough in 1904. In mid-1904, Dr. Wolcott purchased 292 Marlborough, and she and Miss Fisher moved there. On May 26, 1904, 68 Marlborough was purchased from Grace Wolcott by Mary Lowell (Coolidge) Barton, the widow of Frederick Otis Barton, a merchant in New York City. Prior to her husband’s death in February of 1904, the Bartons had lived at 43 East 64th Street in Manhattan. 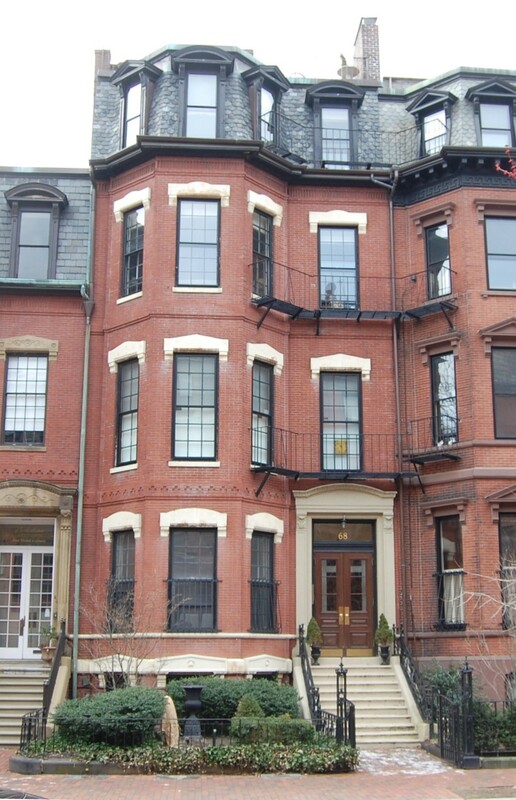 She returned to Boston (where she was born) and purchased 68 Marlborough as her home and the home of their four children: Frederick Otis Barton, Jr., Ellen Randolph Barton, Mary Lowell Barton, and Francis Lowell Barton. Mary Barton and her children continued to live at 68 Marlborough during the 1906-1907 winter season, but moved thereafter. At the time of the 1910 US Census, they were living in Concord, Massachusetts. She continued to own 68 Marlborough and lease it to others. By the 1907-1908 winter season, 68 Marlborough was the home of Dr. Harold Townsend Swain, an obstetrician, and his wife, Harriet (French) Swain. They previously had lived in an apartment at The Grosvenor at 259 Beacon. They continued to live at 68 Marlborough during the 1913-1914 season, but moved thereafter to 226 Commonwealth . In April of 1915, Mary Barton applied for (and subsequently received) permission to remodel the house, including making changes in the basement and to a bay window (probably in the rear). By the 1915-1916 winter season, Mary Barton and her children were once again living at 68 Marlborough. They were joined that year by Mary Barton’s unmarried sister, Ellen Wayles Coolidge. She previously had lived at 81 Marlborough with their parents, Dr. Algernon Sidney Coolidge and Mary (Lowell) Coolidge. Dr. Coolidge had died in January of 1912, and Mary Coolidge had died in February of 1915. Ellen Coolidge resumed living at 81 Marlborough by the 1916-1917 season. Mary Barton’s daughter, Ellen, died in February of 1922 in Switzerland. During the 1923-1924 winter season, the Bartons were living in New York and 68 Marlborough was the home of attorney Henry Eldridge Warner and his wife, Henrietta (Slade) Warner. They had lived at 85 Marlborough during the 1922-1923 winter season. By 1925, the Warners had moved to Lincoln (where they maintained their primary residence), and Mary Barton and her children were living with her sister, Ellen Coolidge at 12 Fairfield (they are listed at both 68 Marlborough and 12 Fairfield in the 1925 City Directory). On May 29, 1926, 68 Marlborough was purchased from Mary Barton by banker Max Ordway Whiting. He and his wife, Marion (Shearman) Whiting, made it their home. They previously had lived in Brookline. They also maintained a home in Manchester. Marion Whiting died in August of 1940. 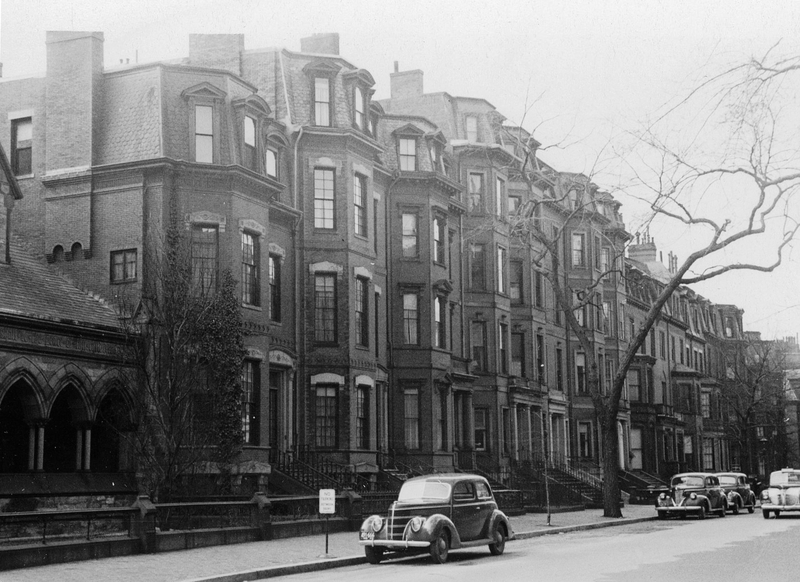 He moved soon thereafter to Brookline, but continued to own 68 Marlborough and lease it to others. By 1941, 68 Marlborough was the home of William Stuart Forbes and his wife, Gertrude (Potter) Cox Forbes. They had lived at 8 Louisburg Square in 1940. He operated a lithography company founded by his father. They continued to live at 68 Marlborough in 1942. By 1943, 68 Marlborough was once again Max Whiting’s home. After living in Brookline, he had lived briefly at 81 Beacon and then moved back to 68 Marlborough. In 1943, he married again, to Constance (Jaques) Wadley Bader, the former wife of Edward Dow Tracy Wadley and the widow of Louis Frederick Stanton Bader. 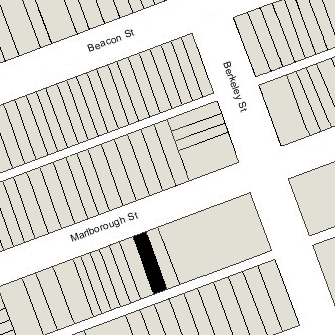 They continued to live at 68 Marlborough in 1947, but had moved to 61 Beacon by 1948. On July 11, 1947, 68 Marlborough was purchased from Max Whiting by Bettina (Fittemore) Makler Winant, the wife of B. Heywood Winant (called Ben Zion Winant). They were interior decorators and previously had lived at 127 Bay State Road. By 1949, they had moved to New York City, where he died in October of 1949. On June 22, 1948, 68 Marlborough was acquired from Bettina Winant by George Constantine Anagnos and his wife, Marie A. (Decoster) Anagnos. They previously had lived at 21 Ridgewood. He was a restaurant chef. In November of 1948, they applied for (and subsequently received) permission to convert the property from a single-family dwelling into a lodging house. They continued to live there, and operate it as a lodging house, until about 1957. On February 4, 1958, 68 Marlborough was purchased from George and Marie Anagnos by Barnett Feldstein and his wife, Edith (Martin) Feldstein. They lived in Newton. In September of 1958, he applied for permission to legalize the occupancy as nine apartments, which he stated had been the existing condition for many years. He subsequently abandoned the application and continued to operate the property as a lodging house. The property subsequently changed hands and on May 14, 1965, was acquired by the Hub Management Corporation (Channing S. MacDonald, president). In August of 1964, it applied for (and subsequently received) permission to convert it from a lodging house into eleven apartments. The property subsequently changed hands, and on November 7,1973 was acquired by Margaret Rothman, Diane Pabich, and Richard Pabich, trustees of the 68 Marlborough Trust. In April of 1974, they applied for (and subsequently received) permission to add an apartment in the basement and increase the total number of units from eleven to twelve, and in August of 1979, they applied for (and subsequently received) permission to reduce the number of apartments to five. On March 5, 1980, the 68 Marlborough Trust converted the property into five condominium units, the 68 Marlborough Condominium.